kitson, on hip Robertson Boulevard, in Los Angeles may be only 6 years old but it has already become the favorite stop for many celebrities and the who's who in Hollywood. kitson believes that shopping should be fun!! Our team of buyers are always on the hunt to find the hottest and newest trends. Don't try to call them as they are always on the go - traveling constantly between New York , Los Angeles and Europe to stay one step ahead of the competition.One trip to kitson and you will be hooked. Looking for the hottest handbag it's here. Got to have that necklace you saw in People Magazine - it's here. Where did Jessica get that t-shirt? Yep at kitson. The store has become so busy that we have expanded to help serve you better. With double the space we will be able to give you more of the great stuff you have come to expect from kitson. We have kitson kids, across the street, and the store is filled with all the hottest new lines for babies and toddlers. We have the kitson men store down the street, so now we are able to give you more of the merchandise that you love! We just opened kitson studio right next door to the kitson men store on Robertson Blvd. An upscale trend setting store stocked full of the latest shoes, handbags, scarves, dresses, accessories and more. 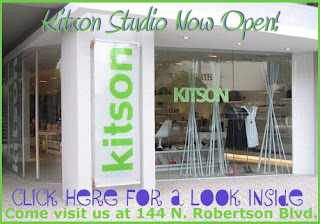 Stop by and experience the luxury that is kitson studio. Once upon a time... LINQ visited the land of BoutiqueToYou and together, they made beautiful clothing available to all the princess fashionistas of the world. Celebrities such as Jessica Alba, fell in love with the LINQ Pintuck Tunic in Peat. Lindsay Lohan was spotted in the LINQ Knee Length Button Hoodie and the LINQ Three Button Jacket. Katherine Heigl found a versatile LINQ Silk Cami Tee. And Terri Hatcher found a romantic LINQ Silk Trimmed V-Neck Tee. And so, it came to be that the people of the world were all able to wear beautiful clothing. And they lived happily ever after! // note: on IE5, these return 4, so use is_ie5up to detect IE5. Preferred Boutique is the world's premier collection of independent boutique hotels that offers the discriminating traveler something different - sophisticated variety. Emphasizing style, service and personality at small luxury hotels around the world, Preferred Boutique is travel inspired.